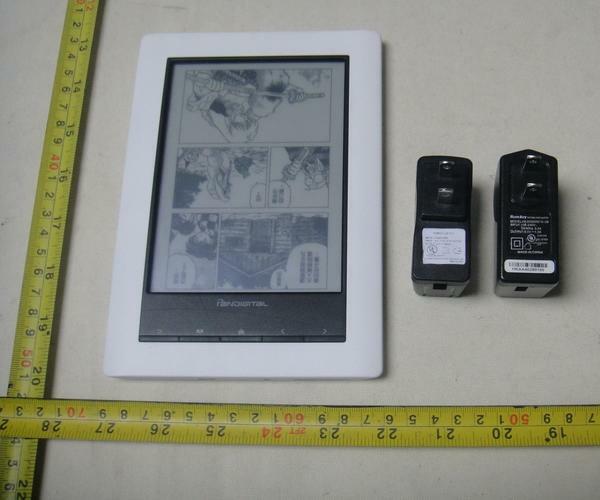 I just found a new ereader from Pandigital on the FCC website today, and it's not one I've seen before. This one is based on a6" screen, and it has Wifi, a touchscreen, internal microSD card slot (1GB), and an external SD card slot. I don't know what screen it's using or who made it, but my guess is that it isn't a Sipix screen. I looked at the FCC paperwork for the Benq ereader which went through in February, and the internal design is completely different. If this were a related device then at least some details would be similar. The speaker, back cover, and internal microSD card suggests that this is a Foxconn design (these details are shared with the original Novel). But Foxconn sends gadgets to the FCC on behalf of their partners, so I don't know why this one showed up under Pandigital's name. But I can say that this ereader should be using a similar firmware. The user manual is also available, and it looks like it will have all the same features. Holy cow! That’s a straight ripoff of Sony’s Reader! All they did was place the page turn buttons on the inconvenient right side. The frame is too frikkin wide. But do you notice the stylus silo at upper right? Wifi in it puts real pressure on Sony’s pricing too. This is getting interesting. I wonder if it will wind up at Borders? Whoops. I lost interest immediately upon seeing the User Manual. It’s locked to Barnes & Noble. Instant FAIL. It has Adobe Mobile and looks like it might do classic Adobe DRM ePub, but the manual skips over that software so it’s probably either utter crap or it’s just for PDF files. I don’t understand the strategy of Kobo and B&N licensing competitor hardware. Amazon doesn’t license competitor hardware. Meanwhile, Kobo will let everyone buy its eBooks but B&N won’t. This is just screwy. so if you had to choose between the kindal or the pandigital, what would you choose.